Get ready to see two of the biggest rock bands of the 70s! 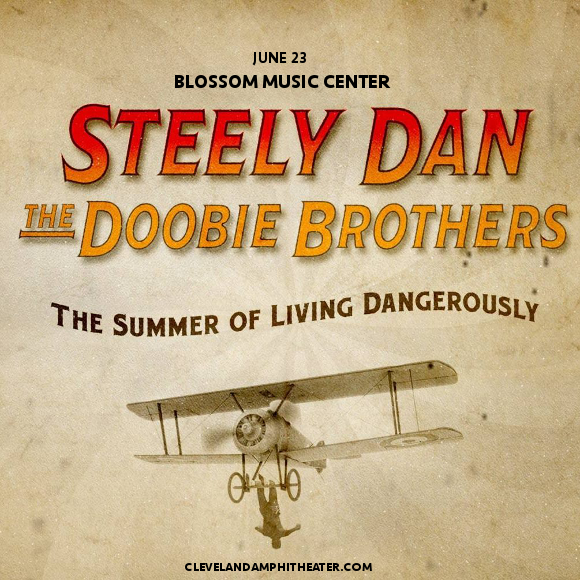 That’s right, it’s Steely Dan and The Doobie Brothers on The Summer Of Living Dangerously tour, live at the Blossom Music Center on Saturday 23rd June 2018!! Tickets already selling fast – book early to avoid disappointment!! Formed in 1972 by core members Donald Fagen and Walter Becker, Steely Dan’s legacy is almost unparalleled by any of their contemporaries. Described by Rolling Stone magazine as "the perfect musical antiheroes for the Seventies,” the band gained a reputation over time for their high level of technical musicality and blending of multiple genres including jazz, pop and rock. Their debut album, “Can’t Buy a Thrill”, saw two singles, "Do It Again" and "Reelin' In the Years" in the Billboard singles chart. Their following albums continued to build their fanbase, culminating in their most successful single, "Rikki Don't Lose That Number,” from the album “Pretzel Logic.” Their devoted fanbase continued to support the band following their massive success until the present day. Since the death of Walter Backer in September last year, this will be Steely Dan’s first major run of shows without him. Donald Fagen fully intends to keep their legacy alive for as long as he can! Experience it all for yourself on June 23rd – get your tickets now, while they last.